Yes, you heard me right...it's Christmas in July!!! Celebrate the “holly-day” season with the new Festive Holly Collection by Heartfelt Creations! Charming and elegant, with a hint of a country feel, this festive collection is filled with heartwarming imagery of falling snow, towering pine trees, and beautiful wildlife all woven together with lavish illustrations of abundant holly and berry clusters! Immerse yourself in a paper collection revealing a traditional holiday color palette of rich reds and fir greens accentuated with sky blues, antique golds and crisp whites all melting together creating perfect backdrops to graceful background imagery of hand stamped post marks, floating music notes, delicate snowflakes, ribbon like swirls and lace like accents. 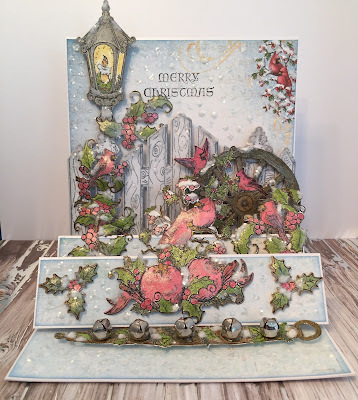 A charming assembling of three delightful cling stamp sets boast enchanting illustrations of red feathered cardinals, abundant holly and berry clusters as well as an antique candle lit lantern and vintage wooden wheel all at the ready to be paired with the coordinating dies and transformed into exquisite dimensional Yuletide embellishments! 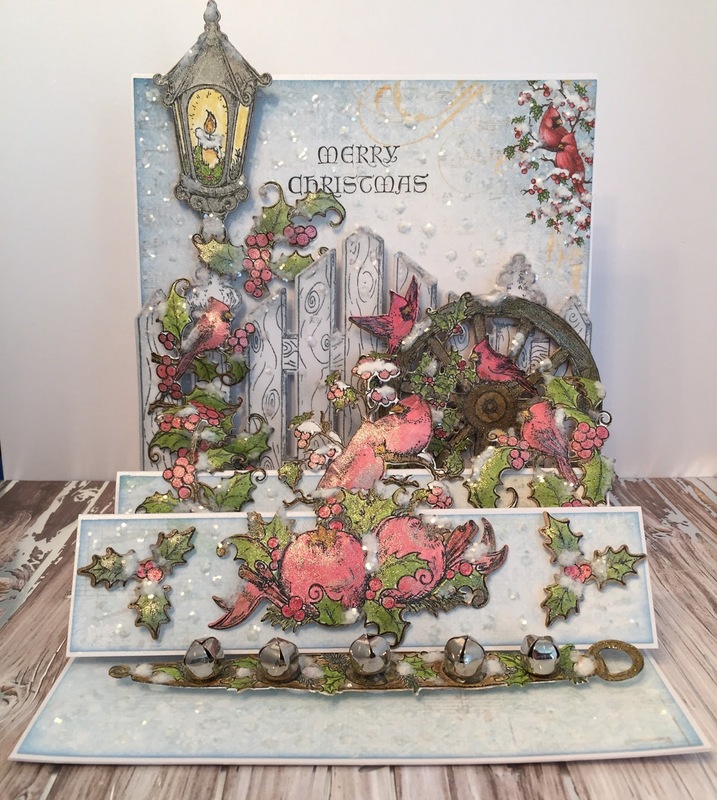 An elegant, lacy decorative arch shaped die lends itself perfectly to create a breathtaking accent or die cut within your card front itself adding a touch of delightful holiday magic, while ornamental sleigh bells ready themselves to ring in the merriest of seasons! Join us as we prepare for the Christmas festivities with the new Festive Holly Collection! Here's a Triple Easel Card I designed to celebrate this beautiful release. Instructions: Finished Card size 6" x 7". Score a 6" x 12" piece of Pearl White Metallic cardstock on the long side at 3" and 6". Fold in half and then make a mountain fold at the 3" score line. Cut a 6" x 6" Mat and glue with Dries Clear adhesive from the edge to the 3" fold. Cut two more 6" x 6" pieces of cardstock and score at 1 1/2" and 3" and make mountain folds. Slide one under the other to about 1 1/2" and glue together. Adhere to the card base. Cut designer paper from the paper pad as shown - one at 5 7/8" x 5 7/8", one at 5 7/8" x 2 7/8" and four at 5 7/8" x 1 3/8". Ink the edges with Memento Summer Sky and adhere to the card base using Dries Clear glue. Stamp all stamps with Memento Tuxedo Black Ink and die cut using the matching dies. Distress the edges of the fence with Memento London Fog. Dab all of the 3D Stamp Paints on craft Mat, spritz with water and paint all the images with a paint brush blending some of the colors together. Shape the images with Deluxe Flower Shaping Kit, add Dries White Adhesive here and there and sprinkle with Cosmic Shimmer Iced Snow. 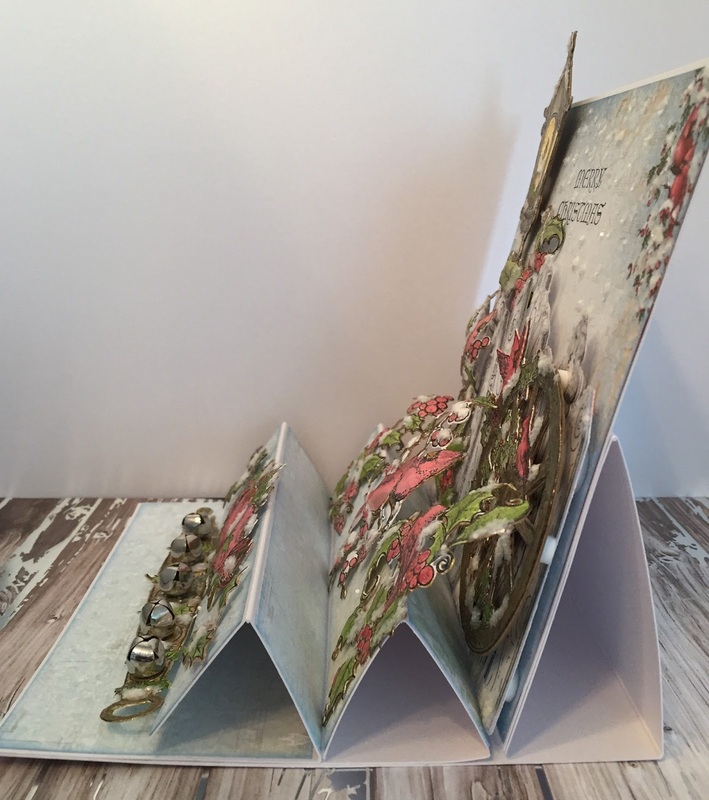 Adhere everything to the card base using Dries Clear Adhesives and dimensionals. Adhere the bells to the bell strap using hot glue gun. Dot the Nuvo Crystal Drops all over the paper base and sprinkle with the Cosmic Shimmer Iced Snow. Add Dries Clear Adhesive to the image on the designer paper and sprinkle with Crystal Ultrafine Transparent Glitter. Thank you so much for stopping by and please leave a comment if you can! Janet, I just had to pop by and tell you how gorgeous this card is! I love the elegant design! Everything is so beautifully composed. 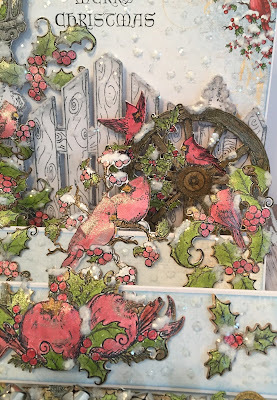 Gorgeous card Jan! I love that special fold! 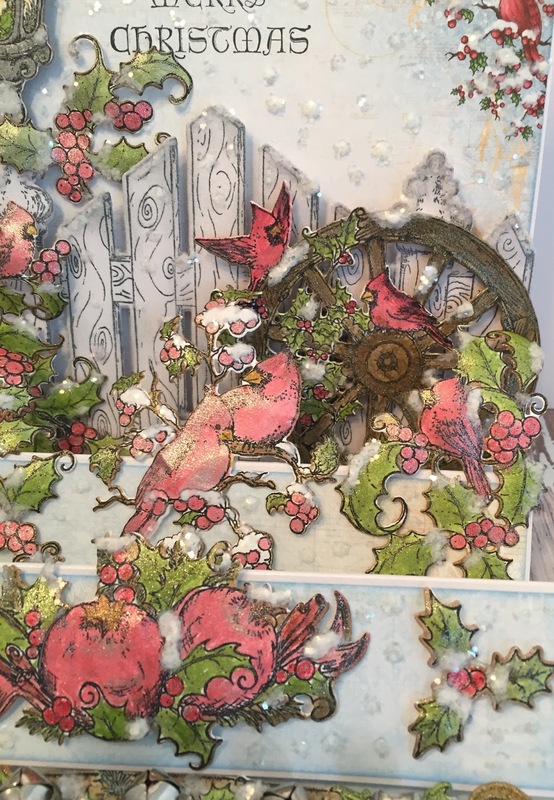 I love this card - it is very snowy and festive! This is gorgeous! I want to copy! Thank you Glenda! I had a lot of fun making this one!